Line-up includes five women this year, with Catherine Marks, Olga Fitzroy and Mandy Parnell all nominated in various categories. The Music Producer’s Guild has revealed the shortlist for the 2016 awards, and Bjork, Mike Crossey (Wolf Alice, Jake Bugg, Foals), Catherine Marks (Howling Bells, Ian Brown, PJ Harvey, Depeche Mode) and Neil Comber, who has worked with over 25 top ten artists, are just some of the internationally acclaimed producers who have secured a place. 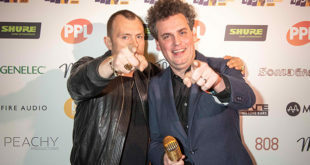 Debut albums including FKA Twigs’ LP1 and Royal Blood’s self-titled effort alongside Mark Ronson’s number one Uptown Special received nominations, while the list also features re-mixers Four Tet (Kieran Hebden) and UNKLE (James Lavelle). 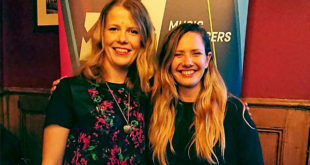 There are five women nominated for awards this year who have worked with over 50 top ten artists between them. This includes Catherine Marks who is up for ‘Breakthrough Producer Of The Year’, Olga Fitzroy who is in the running for ‘Recording Engineer Of The Year’ and Mandy Parnell (pictured with Boy George at the 2015 event) who is in the ‘Mastering Engineer Of The Year’ category. Now in its eighth year, the Music Producers Guild Awards will take place on 3 February 2016 at Grosvenor House, Park Lane in London. 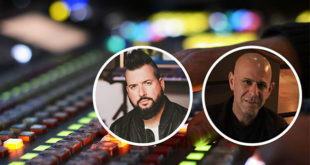 The ceremony will feature 15 awards categories, recognising the best and brightest names in music production including the Producer of the Year, who will also be awarded the first Brit Award. The winners of the Outstanding Contribution to UK Music Award, the MPG Innovation Award and the MPG Inspiration Award will be announced at the Awards ceremony in February.